Charlie Wall of Warton challenges Michael O'Neill for St Annes. Warton Typhoons took control with three goals in the first half of their Blackpool and District Youth League Under-14 contest away to St Annes Diamonds, who battled bravely on in a second half which brought a goal for both sides as the match ended 4-1. Despite seeing his side race away to a 3-0 half-time lead at Blackpool Road North on Saturday morning, Warton manager Archie Gemmell wasn’t entirely satisfied with his side’s first-half display and thought they started slowly. But, after failing to take a couple of one-on-one opportunities, Warton were more clinical in front of goal; no-one more so than striker Jonathan Bennison, who netted twice. The Typhoons’ goals were not spectacular but well-worked, their third coming at a crucial point on the stroke of half-time. Besides Bennison’s brace, their other pair were a good finish from right-winger Christopher Bamber and striker Ethan Armett’s tap-in as Warton took the game beyond their hosts. Diamonds were forced into changes for the second half and their efforts were rewarded with a goal. 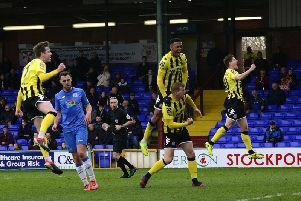 Harvey Wilcock scored it with a spectacular improvised strike from a corner, described by manager Neil Jones as ‘a reverse scorpion kick’. It followed a period of home pressure, with improving new player Charlie Stephenson to the fore. And Diamonds did have other chances, most notably Joel Smith-Jones’ effort from just inside their opponents’ half which the keeper gathered. If Warton boss Gemmell had some complaints about the performance, he has few over his team’s season so far. “St Annes changed things around in the second half and we didn’t step it up. They are a pretty good side but are not getting the results. Manager Jones was pleased with the way his Diamonds side took the fight to Warton after half-time. “We shook it up and really put the effort in,” he said. “There were plenty of good signs and reasons for optimism. “It was fairly even up to a point but they took their chances and the third goal just before half-time was important. Wilcock was named the Diamonds man of the match. He took his goal in spectacular style and can operate successfully in midfield as well as up front. The Typhoons man of the match award was shared between two-goal striker Bennison and Noel Eastham, who had a fine game on the left wing.